On becoming a nova, it ejected filaments in all directions and the solar system became illuminated as if by a hundred suns. It subsided rather quickly and retreated into far-away regions. Peoples that remembered early tragedies enacted in the sky by the heavenly bodies asserted that Jupiter drove Saturn away from its place in the sky. Before Jupiter (Zeus) became the chief god, Saturn (Kronos) occupied the celestial throne. In all ancient religions the dominion passes from Saturn to Jupiter. In Greek mythology, Kronos is presented as the father and Zeus as his son who dethrones him. Kronos devours some of his children. After this act Zeus overpowers his father, puts him in chains, and drives him from his royal station in the sky. In Egyptian folklore or religion the participants of the drama are said to be Osiris-Saturn, brother and husband of Isis-Jupiter. The cult of Osiris and the mysteries associated with it dominated the Egyptian religion as nothing else. Every dead man or woman was entombed with observances honoring Osiris; the city of Abydos in the desert west of the Nile and north-west of Thebes was sacred to him; Sais in the Delta used to commemorate the floating of Osiris’ body carried by the Nile into the Mediterranean. What made Osiris so deeply ingrained in the religious memory of the nation that his cult pervaded mythology and religion? Osiris’ dominion, before his murder by Seth, was remembered as a time of bliss. According to the legend Seth, Osiris’ brother, killed and dismembered him, whereupon Isis, Osiris’ wife, went on peregrinations to collect his dispersed members. Having gathered them and wrapped them together with swathings, she brought Osiris back to life. The memory of this event was a matter of yearly jubilation among the Egyptians. Osiris became lord of the netherworld, the land of the dead. A legend, a prominent part of the Osiris cycle, tells that Isis gave birth to Horus, whom she conceived from the already dead Osiris, and that Horus grew up to avenge his father by engaging Seth in mortal combat. In Egyptology the meaning of these occurrences stands as an unresolved mystery. The myth of Osiris “is too remarkable and occurs in too many divergent forms not to contain a considerable element of historic truth,” wrote Sir Alan Gardiner, the leading scholar in these fields; but what historical truth is it? Could it be of “an ancient king upon whose tragic death the entire legend hinged” ? wondered Gardiner. But of such a king “not a trace has been found before the time of the Pyramid texts,” and in these texts Osiris is spoken of without end. There he appears as a dead god or king or judge of the dead. But who was Osiris in his life? asked Gardiner. At times “he is represented to us as the vegetation which perishes in the flood-water mysteriously issuing from himself. . . .” He is associated with brilliant light. After a life of studying Egyptian history and religion Gardiner confessed that he remained unaware of whom Osiris represented or memorialized: “The origin of Osiris remains from me an insoluble mystery.” Nor could others in his field help him find an answer. The Egyptologist John Wilson wrote that it is an admission of failure that the chief cultural content of Egyptian civilization, its religion, its mythological features again and again narrated and alluded to in texts and represented in statues and temple reliefs, is not understood. The astral meaning of Egyptian deities was not realized and the cosmic events their activities represent were not thought of. The worship of the sun and the planets was decried by Jeremiah, a contemporary of Ezekiel. But what was this weeping for Tammuz? Tammuz was a Babylonian god; one of the months of the year, approximately coinciding with July, in the summer, was named in his honor; and by this very name it is known in the present-day Hebrew calendar. Tammuz was a god that died and was then hidden in the underworld; his death was the reason for a fast, accompanied by lamentations of the women of the land. His finding or his return to life in resurrection were the motifs of the passion. Of Tammuz it also is narrated that he was associated with brilliant light, with descent into the nether world, visited there by Ishtar, his spouse. Tammuz’ death, his subsequent resurrection, or his discovery in the far reaches, but no longer brilliant, were the themes of the cult that was not just one of the mysteries, but the chief and paramount cult. The Osirian mysteries, the wailing for Tammuz, all refer to the transformation of Saturn during and following the Deluge. Osiris was not a king but the planet Saturn, Kronos of the Greeks, Tammuz of the Babylonians. The Babylonians called Saturn “the Star of Tammuz.” After the Deluge Saturn was invisible (the sky was covered for a long time by clouds of volcanic dust) and the Egyptians cried for Osiris, and the Babylonians cried for Tammuz. Isis (Jupiter at that time) went in search of her husband, and Ishtar (also Jupiter at that early time) went to the netherworld to find her husband Tammuz. For a time Saturn disappeared, driven away by Jupiter, and when it reappeared it was no longer the same planet: it moved very slowly. The disappearance of the planet Saturn in the “nether world” became the theme of many religious observances, comprising liturgies, mystery plays, lamentations, and fasts. When Osiris was seen again in the sky, though greatly diminished, the people were frenzied by the return of Osiris from death; nevertheless he became king of the netherworld. In the Egyptian way of seeing the celestial drama, Isis (Jupiter), the spouse of Osiris (Saturn) wrapped him in swathings. Osiris was known as “the swathed"—the way the dead came to be dressed for their journey to the world of the dead, over which Osiris reigns. Similar rites were celebrated in honor of Adonis, who died and was resurrected after a stay in the netherland, in the mysteries of Orpheus. Sir James G. Frazer, the collector of folklore, came to regard Osiris as a vegetation god; likewise he saw in the Babylonian Tammuz, an equivalent of the Egyptian Osiris, a vegetation god and, carried away by this concept, wrote his The Golden Bough, built around the idea of the vegetation god that dies and is resurrected the following year. A few peoples through consecutive planetary ages kept fidelity to the ancient Saturn, or Kronos, or Brahma, whose age was previous to that of Jupiter. Thus the Scythians were called Umman-Manda by the Chaldeans"People of Manda"—and Manda is the name of Saturn. The Phoenicians regarded El-Saturn as their chief deity; Eusebius informs us that El, a name used also in the Bible as a name for God, was the name of Saturn. In Persia Saturn was known as Kevan or Kaivan. The different names for God in the Bible reflect the process of going through the many ages in which one planet superseded another and was again superseded by the next one in the celestial war. El was the name of Saturn; Adonis of the Syrians, the bewailed deity, was also, like Osiris, the planet Saturn; but in the period of the contest between the two major planets, Jupiter and Saturn, the apellative of the dual gods became Adonai, which means “my lords” ; then, with the victory of Jupiter, it came to be applied to him alone. Saturn always had a negative, if not evil significance. In ancient times, it has been called “The Greater Malefic” which was opposed to Jupiter, “The Greater Benefice”. Saturn is esoterically associated with man’s limitations, restrictions, death and decay. His Greek name was “Kronos”, the ruler of time, time being the main factor inevitably leading to the death of mortals.Traditional representations of the “grim reaper” originate from the attributes of the god Saturn, who held the sickle with which he slain his father. 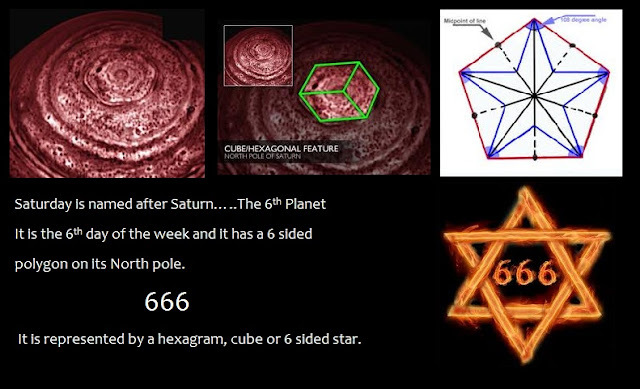 Saturn has also been associated with Satan and this, for numerous reasons. First, many authors argue that the word Satan is derived from the word Saturn. 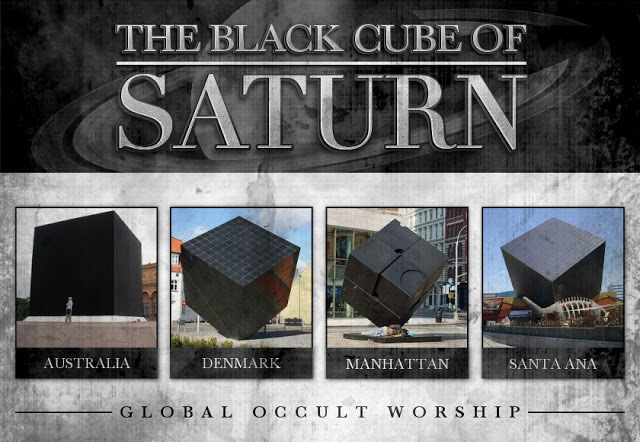 Second, Saturn is associated with the color black as well as Satan. Third, Ancients considered Saturn to be the farthest planet from the sun , the latter being associated with the principle of Good. (Note that Pluto never was considered a planet). Saturn is consequently the celestial body that is the less exposed to the sun’s divine light and thus associated with the coldness of the principle of Evil. Finally, the “great god Pan”, the horned deity, represented Saturn in ancient paganism. This half-man half-goat creature is considered the ancestor of our modern depictions of Satan. “Pan was a composite creature, the upper part–with the exception of his horns–being human, and the lower part in the form of a goat. (…)The pipes of Pan signify the natural harmony of the spheres, and the god himself is a symbol of Saturn because this planet is enthroned in Capricorn, whose emblem is a goat” – Manly P. Hall, Secret Teachings of All Ages So Pan was depicted with horns due to the fact it represented Saturn, the ruler of the house of Capricorn which symbol is a goat.